Lang Ping, head coach of Chinese Women’s Volleyball National Team and Li Yan, head coach of Chinese Short Track Speed Skating Team are two legendary women coaches who became close friends when they were in charge of the national teams of the USA. Since returning to China, they have both had to face a lot of challenges and obstacles, but have continued to support each other through hard times, and have accomplished huge achievements. 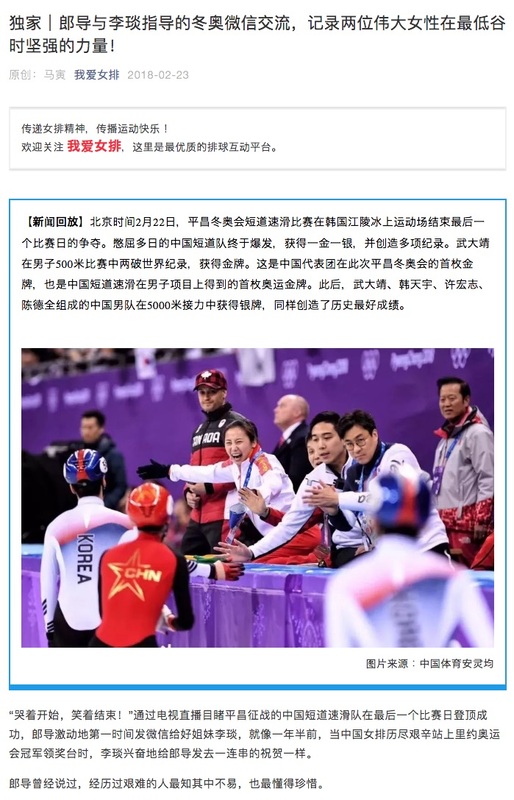 This article tells a story of a WeChat communication between Lang and Li during the 2018 PyeongChang Winter Olympics when Li and her team was suffering. It reveals how they encouraged each other and eventually overcame difficulties, showing the strong inner power of two outstanding women coaches of China.